This dish is popular in the costal area of Goa and Karnataka. One more seafood that is not seen in Chennai and hence had to import from Bangalore. Since they get most of their seafood from Mangalore. Wash and steam the clams for 10mins. Take a little oil in a pan sautee the small onion till transulant, add the scrapped coconut and fry till you get the right aroma and the coconut is a little crisp, just before switching off the fire add the jeera and garlic and leave it to cool. Take another pan add oil and fry the large chopped onion, when slightly brown add ginger and turmeric and sautee for sometime add Corriander powder chilli powder and sautee for some more time. 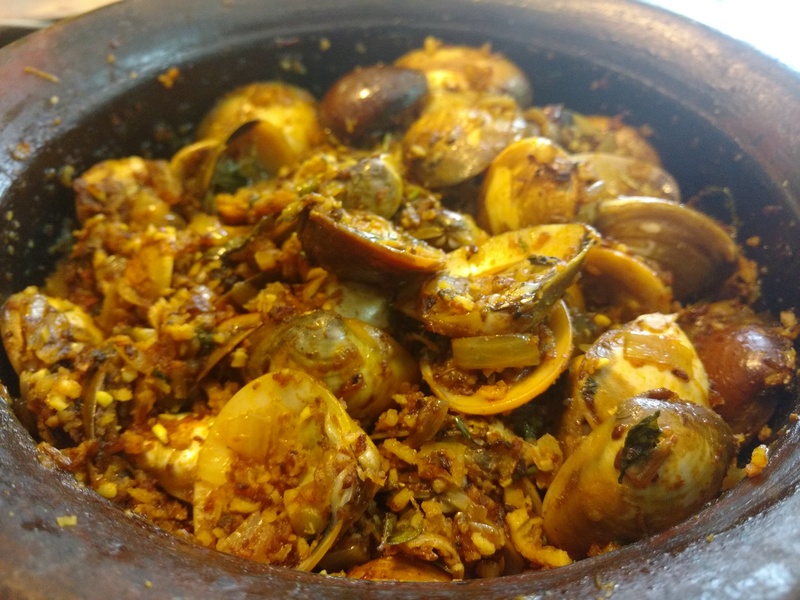 When all the masala has come together add salt and the steam clams. Cover and cook till the masala and clam have blended well. Take the roasted coconut and dry grind coarsely. Add to the clams. Garnish with corriander leaves, open and cook for all the water to evaporate.